As I mentioned in a previous post, while pitching to publishers is by no means prohibited or even frowned upon at the Gathering, I knew that it’s not what Alan wants the event to be about, so I tried hard to keep things light and casual as much as possible. I didn’t set up any appointments in advance at all – with the exception of a meeting with Canadian publishers, Filosofia. They already had our game, Akrotiri and had expressed interest to us regarding EIEI-O, so I emailed them to set up a time when we could play it together. We said we’d meet up sometime on Sunday. We found each other as planned and then set an actual time to playtest the games on Monday morning. Otherwise, Rob Bartel and I would walk around and, every once in a while, we would bump into people with blue badges (meaning that they were with a publishing company). We’d engage in some small talk with them and they generally would be very warm and welcoming to us – possibly because we had red badges (i.e. be nice to the newbies!). Then we’d ask if they were looking at submissions while they were here. Most of them were actively seeking new designs. Sometimes, we’d immediately find a nearby table and start pitching while, other times, we’d set up a meeting that worked best for their schedules. Rob and I decided to play a game of Hungry Cities – a game from fellow GAC member, Roberta Taylor. As we were setting up, Stephan from Iello Games walked by our table and so we invited him to play. He agreed and ended up playing the full game with us! We chatted about the game afterwards and agreed to hook up later in the week so he could review other games from us. I`m not sure how we bumped into Stefan from Asmodee, but we did and he was open to seeing some pitches. Rob and I grabbed our sales sheets (Step 14) and found a table. Rob did a great job of putting all his sales sheeting in a 3-holed binder, and then sorted them from light to heavy. This was an excellent idea as it allowed us to jump to whichever section was more interesting to each publisher. The 3-holed binder was perfect for pitching as well. I had used a folder, but that caused some of the pages to get crinkled or bent in the corners. The binder was used just for pitching. If the publisher liked a game, then Rob gave them a fresh sales sheet (without any holes) from the stacks he brought in a separate box. We would start the pitch session by asking the publisher what they were specifically looking for, tailoring our pitches based on this information. If they were looking for light, family games then we wouldn`t pitch them any of our heavier Euro games, and vice-versa. Rob and I have different styles of pitching – it was interesting to be present to witness how another person pitched. Rob has a more thorough approach of giving the publisher a full overview of the game, while my style gives more of a high level snapshot of the key points in the game (Step 16). Both approaches were effective depending on the game being pitched and the publisher we were pitching to. 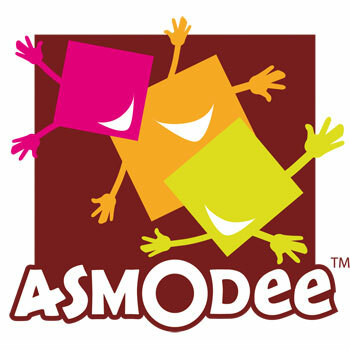 Asmodee expressed interest in a number of our designs. We played EIEI-O and he liked it. We played Eat at Joes and he ended up taking the prototype of Eat at Joe’s with him! In total, we spent around 3 hours with Stefan! We kept showing him more sales sheets and, if he expressed interest, then he would want to see the prototype and play a round or two. He expressed interest in Akrotiri and I let him know that it was currently with Filosofia. At that he said that was fine because if they pick it up then he would most likely do the foreign version of the game! Sweet! He then wanted to see a game from GAC member, Graeme Jahns called Iron Horse Bandits. I had brought this one as I really liked the mechanics involved. The playtest went well, but we discovered a few aspects that need a bit more tweaking. It was interesting to hear him say that the theme would have to change a bit. Currently in the game, players are bandits and they are shooting at lawmen and stealing loot. He didn’t think that theme would be appropriate for the family audiences that Asmodee would like to target. He wasn’t concerned with it though as that was an easy change. With some tweaks to the game, he’d like to see it again. I had been asked if I wanted to see Cabin in the Woods. Even though I had already seen it, I wanted to see it again. So, later that night, 5 of us drove out to see the movie. I ended up sitting next to Chris Handy and JF. We hit it off as we all had similar tastes in movies! Chris was a fellow designer who would end up playing an important role in the days ahead. JF, unbeknownst to me at the time, actually works for Filosofia and ended up being present at the meeting I had set up the next morning! How much of a coincidence is that? The next few posts will review the following days of The Gathering and the various other publishers I met. This entry was posted in Event, Misc., Updates: Unpublished Games and tagged akrotiri, alan moon, asmodee, board game, filosophia, gathering, gathering of friends, hungry cities, iello, iron horse bandits, rob bartel by designerjay. Bookmark the permalink. Glad you decided to join us at the movie Jay. One of my highlights of the Gathering.